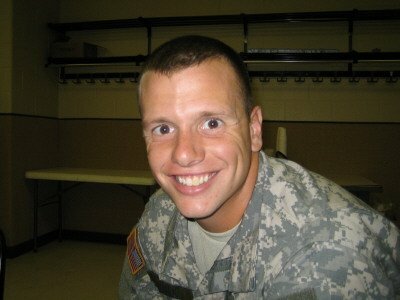 Hometown: Freehold, New Jersey, U.S.
Died: November 19, 2005 in Operation Iraqi Freedom. Unit: 1st Battalion, 187th Infantry Regiment, 3rd Brigade Combat Team, 101st Airborne Division, Fort Campbell, KY.
Army 1st Lt. Dennis W. Zilinski II died November 19, 2005 in Iraq of injuries suatained in a roadside bombing, family members said in a prepared statement. Zilinski, 23, had only been stationed in Iraq since September 17, 2005 and was engaged to be married to 2nd Lt. Marie Cicerelle, who is also staitone din Iraq, the statement said. "Too many people have been affected by this tragedy," the statement said. "There is nothing that can replace this dedicated, high-spitited individual. Befriended by so many, and loved by everyone he met, Dennis notably demonstrated his personal desire to be a friend, companion and courageous leader." He was killed near Bayji, 155 miles north of Baghdad. The statement- issued by Zilinski's parents, Dennis and Marion, in lieu of speaking with the media- said their son was assigned to the 1st Battalion, 187th Infatry regiment, 3rd Brigade Combat Team, 101st Airborne Division(Air Assault) at Fort Campbell, KY.
A 2000 graduate of Christian Brothers Academy in Middletown, Zilinski was remembered in a statement "as a very willing person" who loved his country and the Army. 1LT Dennis William Zilinski II, 23, was a rifle platoon leader with Bravo Company, 1st Battalion, 187th Infantry Regiment, 3rd Brigade Combat Team (Rakkasans), 101st Airborne Division out of Fort Campbell, Kentucky. He and three other Soldiers were killed when an improvised explosive device detonated near their HMMWV during combat operations in Bayji, Iraq on 19 November 2005. 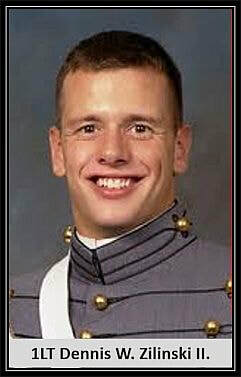 While at West Point, 1LT Zilinski majored in Basic Sciences and Leadership, with his required engineering concentration in Systems Engineering. As a Cadet, Dennis also completed Airborne School at Fort Benning, GA.
1LT Zilinski received the CPT Michael W. Kilroy Award for serving as the USMA swim team captain. Dennis also received the Class of 1923 Award for being the graduating senior who exhibited qualities of leadership and sportsmanship on the swim team. After graduation from West Point, 1LT Zilinski attended the Infantry Officer Basic Course. Dennis completed Ranger School and received his Ranger tab - a lifelong goal and his proudest accomplishment. Dennis is survived by his father and mother, Dennis and Marion Zilinski, his fiancée, Marie Cicerelle (USMA 2004), his brothers Doug (wife Toni) Kenner and Matthew Zilinski (NJARNG), and his sisters Michele (husband David) Vaughn and Tiffany (husband Lamar) Shiver.